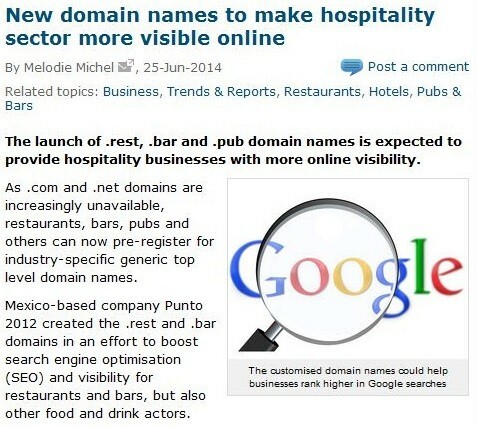 New Domain Names Make Restaurants Easier to Find on Google Places U.K.
As of late June, 2012, there are over 57 million people in the United Kingdom (at precisely 83.6% of its overall population) who use the Internet to keep abreast of current events, stay in touch with friends and colleagues, and even look up restaurants just like the one you own. To ensure they’ll be found, many restaurants have claimed themselves a website or two to establish their online presence coupled with services like Google Places U.K. to increase their visibility. Together, these will ensure greater chances of an actual physical visit by real customers. This is splendid news for hospitality websites that have already hired SEO (search engine optimisation) providers like Whitehat SEO Ltd to ensure they stay at the top of the search results pages. If yours is not among them, then here are a few tips to get those Google Plus Local reviews coming in… along with more business for your establishment. For one, you can start by utilising the power of social media, especially Facebook and Twitter. Through these sites, you can share pictures of your latest items as well as run promos and contests with rewards that will keep your loyal customers and encourage new ones. You will also be able to monitor customer feedback, which will help you respond to your customers’ needs and wants. Having an online ordering system will also go a long way. Modern life is all about convenience, and if customers can get a taste of what you have to offer with little to no effort, you can be sure they’ll be thinking of you the next time they need a meal in a jiffy. Lastly, try to ensure you are linked to by other websites. SEO providers like Whitehat can write offsite content for your web page that will not just increase visitors, but increase visibility under major search engines as well. Let them do the job for you and you’ll be able to focus on what really needs your attention most: growing your business.